With the symphonic power metal style of Nightwish serving as inspiration, Austria's Visions of Atlantis came together in 2000 and put forth their debut effort two years later. Almost immediately the line-up shuffles began, with two of the original members leaving the band. Two more albums were released as band members came and went, but through it all Visions of Atlantis managed to deliver consistently good - if unremarkable - power metal. For Delta, the band's fourth full-length, Greek chanteuse Maxi Nil (ex-Elysion) steps behind the microphone to share vocals duties with Mario Plank. Although the band's sound is rooted in the Nightwish style, they are anything but a clone. What most sets Visions of Atlanta apart from the genre leaders, in a good way, are the vocals. Plank and Nil have a chemistry consistent with that of Scabbia and Ferro of Lacuna Coil, sharing vocal duties about equally and each possessing a range complimentary to the other. Nil's style isn't as operatic as some singers in the genre, but remains soothingly strong as she exercises her versatility. The song that best exemplifies her abilities is "Memento", where she flawlessly soars above her typical mid-range and shares an interesting operatic interplay with Plank. For his part, Plank has a decent mid-ranged style with just a hint of gruffness to it. He briefly delves into a harsher style than normal on "New Dawn", a nicely paced rocker with some sweeping interludes, and delivers a gritty performance on the aggressive "Elegy Of Existence". The heaviest song on Delta, "Elegy Of Existence" also stands out for some tantalizingly chunky riffs courtesy of Werner Fiedler. What bothers me most about Delta is the fact that Martin Harb's keyboard work is front-and-center on practically every track, too often relegating Fiedler's six-string activities to the background. Harb does a fine job creating a lush atmosphere through some very majestic and triumphant-sounding passages (check out "Black River Delta" and "Conquest Of Others", not to mention the instrumental "Sonar" which would be a perfect fit for a James Cameron film), but on tracks like "Twist Of Fate" it's frustrating to have to strain to pick up Fiedler's noodling leads beneath the keys - however passionate and catchy they may be. It's a minor gripe for sure, rooted in personal preferences, and one that most fans of European-styled power metal won't likely share. Delta isn't a groundbreaking album, but in my opinion that's not the only stick by which an album should be measured. 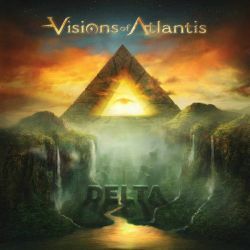 As a contribution to the symphonic power metal style, Vision of Atlantis' fourth album is a solid effort that more than warrants attention from genre fans.